You are invited to a backyard cookout and rock `n` roll party. We`ll be jiving to the top 40 hits of 1959 while the chicken is grilling on the barbecue. It`s a cookout with a twist as you go back in time to 1959 for this Murder Mystery Party. Rock `n` roll, hula hoops, pony skirts, hot rods, and black leather jackets set the scene. The setting is a sizzling backyard cookout at the Kansas City home of Tom Dooley. A sudden thundershower sends his guests rushing into the house while Tom stays behind to finish cooking the chicken. When the squall ends a short time later, Tom`s guests return outdoors to find his lifeless body lying beside the barbecue and the chicken burning to a crisp. It is a case of cold blooded murder over a hot grill and you may be a suspect. 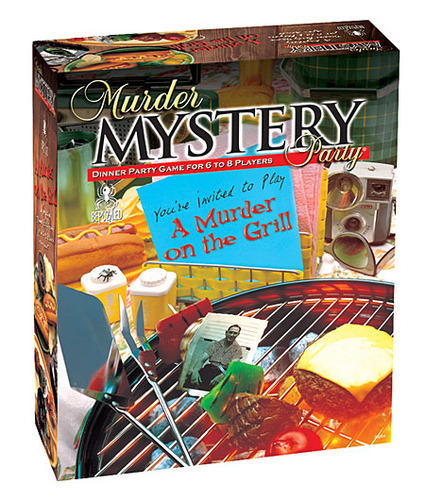 This game set includes everything you need to serve up mystery, murder, and fun. Just invite eight of your friends to dress up and play the roles of the devious suspects, serve up a meal or a snack, and you`re ready for some drop dead fun!